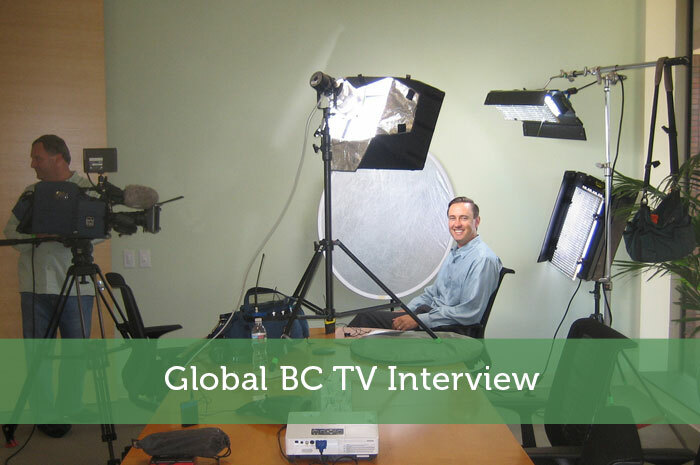 Earlier today I had the pleasure of doing a TV interview with Elaine Yong for Global BC News. Despite being pretty nervous, I knew it was something that I shouldn’t pass up. We had a good chat about a recent BMO retirement survey among young Canadians. I admit that my nerves got the better of me and I forgot to mention a lot of points. Still it was a great experience. If the interview isn’t too embarrassing I’ll have to post it on my blog. If you don’t hear about it again, you know why lol. You might also be interested in checking out some of the other best Canadian personal finance blogs. If this is your first time here, I invite you to subscribe to my RSS feed. Or you can follow my blog on Twitter or Facebook. What are your thoughts about young people and their views on retirement planning? Do you think a lot of young people are going to struggle with saving for retirement after neglecting it during their 20s? Congrats, I will have to watch the online video as we don’t have a tv. Yup it should be online later tonight. well that is a heck of a blogoversary present for you! Congrats. It was a pretty cool offer and an interesting experience. I don’t know how much exposure it will generate, but it was still awesome to be interviewed on tv lol. Closer to 1 minute of fame, but to see and hear myself on tv was pretty sweet. I know I should save for retirement but it seems so far off for me. My parents have always told me that if I can save 1/2 of what I earn, I’ll be able to retire early. At this point, my goal is to get through college without any student loans! Trying to save 1/2 of what you earn is pretty aggressive. You’d have to be making some pretty good cash to manage that. If you’re still in college you don’t have to worry about it yet. It is something to keep in mind after college though. I may have been a bit overly optimistic about the amount of exposure I’d get. I forgot that young people don’t watch the news. So even as the 2nd story of the broadcast, I think it’s a limited audience for this kind of story. Wow that is awesome Jeremy! Definitely beats out my guest posting for sure because I’m sure a lot more people will see this! Hopefully you get some decent traffic to your blog! Actually I’d take the msn.com frontpage mention you got over this. Maybe this will be a springboard to more exposure though. I do prefer strong SEO links though. It’s a lot easier to leverage. Neat! The clip isn’t as bad as you make it out to be and I’m sure the publicity will be positive. I don’t normally chop veggies like that, but with the pressure of the camera I did a pretty bad job lol. No the video isn’t too bad, but it’s weird hearing your voice and it’s not what’s in your head. I would have been nervous. I think you did good in your interview and made some good points. My favorite being that you should start young and get used to that lifestyle. That is what we have been doing for the past couple years with our raises. Acting like we don’t have them and live off of what we were before. I think in the long run that will pay off. I was damn nervous, but I had a bit of liquid courage lol. That might’ve been why I forgot to mention stuff. The actual interview was much longer and then they just use some of the better lines. That and me doing veggie chopping and rollerblading lol. That’s totally what you have to do with raises, consider it a raise on your monthly investment contribution amount. It was a good little news segment too, hopefully people will listen, because what you said is true! Savings will compound over time, but if you keep blowing all your money now, well…that ain’t no good. Kiss retirement goodbye! Haha thanks TB. I always had a photo on my about page, but now you also know my voice. I don’t think many people will really listen though. They’d actually have to be watching the news for that to happen. Maybe some people will clue in though. Congratulations man, that’s pretty awesome! Hopefully it reaches people that are really listening. Loved what you said about getting used to the savings lifestyle. Once you establish good habits they just tend to happen. Yeah some people just get intimidated by trying to change their spending habits. They assume it will make them miserable. Really though they can make all kinds of changes that will save them money and it all just becomes habit. That’s a pretty great experience! I’m going to watch the video as soon as I get into work. I was downtown at the fireworks last night so I didn’t get the chance to see it live – glad I don’t have to force you to hand it over! Yeah now I’ll be that much more comfortable for my next tv interview lol. It was a lot less intimidating having it in my apartment. If it was in a studio it would be a lot more overwhelming. I hope the novelty selling at the fireworks went well. Congratulations on the interview. I hope that it leads to even more success on your blog, and that people will actually listen to what you had to say. Thanks Khaleef. I think it should help my blog a fair bit. It will probably be limited initial exposure, but I’m sure I can find ways to leverage it. That’s a great interview! Congrats on getting featured, hopefully you’ll be able to see some great traffic results on your blog. That veggie chopping though…you’re going to cut your fingers off! haha….well I think it’ll be a long time before anyone is filming me chopping veggies. So I won’t be doing it so haphazardly for a while. Traffic from his was so-so since they only show the url in the middle, but hey now I can say I was on the local news. Congrats Jeremy! I hope you get some extra traffic to the site!! Maybe I missed it but did they mention your blog name? That’s the first time I’ve heard your voice and your accent is awesome! lol I hate hearing my voice on tv. Why isn’t the same as the voice in my head?? I thought they missed mentioning my blog name at all, but when they start the actual interview it’s in subtitles at the bottom. Next time I’ll have to insist they say it aloud too. lol tell me about it. Friends up in Kitimat even saw it. Thanks Jessica. what a baller! That salad looks delicious! lmao about the salad. It was pretty tasty. I ate most of it before doing the rollerblading scene haha. Great interview (^_^) You’ve made some very valid points. I think reality hits everyone sooner or later. The young adults of today who aren’t saving anything and still expect to retire early will eventually realize they have to lower their expectations 🙂 Lol, I heard someone chuckling in the background after you mentioned you’re naturally cheap. I had better points written down in my notes beforehand lol. That was Elaine Yong the interviewer laughing about me being cheap. It was just me, her and the cameraman. Holy crow! You’re a TV star! This is so going in my blog round up. Congrats!! Cool, thanks Ellen. I always appreciate all your round up mentions, even now that I’m a tv star lol. Well done! You’re a TV star now! It’s great that you were featured in a spotlight to help advise a younger generation on the value of saving, because God knows, we need it! hahah….sure you can have an autographed photo. That’s $9.95 plus shipping and handling 🙂 Hey I gotta cash in on this somehow. It was good that I was contributing to positive tips for the younger generation. I do really like helping people. lol I think most of the new readers are people who know me offline. The url was shown too briefly for most people to notice. I promote other bloggers enough that they should find you guys. I dunno…after they saw me chopping veggies I might’ve blown my chance lol. I might have to cut that part out for my acting portfolio 😛 No it would be cool to get in the press again. I think a newspaper mention might be better though since the url or blog name would be right in front of them to not miss. Honestly I think we can reach young Canadians via blogs easier. Most just keep too busy to watch the news. While they’re online though we have a better chance of catching their attention. We just have to work hard at getting exposure on social media and other websites. Congrats Jeremy. You did pretty good. Thanks Shilpan. I thought I would do much worse. I was even initially leaning towards declining it thinking I wouldn’t be able to do a good job with it. I don’t suppose you mentioned me as your favourite blog on TV did you? I think they would’ve cut that part out anyway. They asked a bunch of questions and just took the best quotes from that. DUDE! YOUR FAMOUS!!! Nice work with your interview. You’re a total natural! After some liquid courage I’m a natural lol. Or maybe the parts they didn’t use were pretty bad. Who knows. Thanks MMD.